Prices on grain, corn and other crops continue to rise amid global drought. Dry riverbeds, idle wind power stations, vast fields of shriveled, withered corn – the U.S. is experiencing the worst drought in fifty years. The Mississippi River has become so shallow that tourist boats are no longer allowed to sail in it. But the U.S. is not the only country affected by the drought – in Brazil, rainfalls are destroying the sugar cane crops while in India, the rainy season is late and much of the crops have been destroyed by heat. Australia and Russia have also been hit with a heat wave. According to estimates from the Russian Ministry of Agriculture, the heat wave has already destroyed 6 percent of cultivated area in the country, with the Southern Federal District suffering the most. As a result, food prices have rocketed around the globe. For instance, the FAO Food Price Index rose by 6 percent last month alone. Some commodities have experienced much higher price increases, including grain (17 percent), corn (23 percent) and sugar (12 percent). 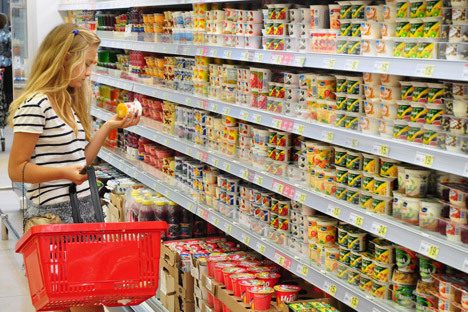 Russian manufacturers are reportedly already negotiating price adjustments with retail chains. The price of bread, for example, is expected to go up by 10 percent. The price increases have been noted at the highest political level: In September or early October, the leaders of the G20 will hold an extraordinary meeting in order to discuss food inflation measures. Similar food problems in 2007-2008 provoked social unrest in a number of countries and are said to have been the catalyst for the Arab Spring. This year’s price increases could end up being worse than what was seen in 2007-2008, given the prices at this point in the season. “The situation actually is difficult, especially given that it’s only the beginning and the harvest has not yet been gathered,” Rylko said. “It’s difficult to say how the situation is going it develop”. The expert believes that, as usual, the most vulnerable consumers will be the consumers from developing countries and the poor. Russia will likely suffer as well. Russian consumers already spend over a third of their income on food (compared with 10 percent in the United States). However, Russia does not face problems with such important products as potatoes, grains and vegetables, and forecasts suggest that there will not be problems. Additionally, Russia is almost completely self-sufficient in the production of sugar and poultry. Experts suggest that Russia will not suffer from a lack of food, and that actually the high food prices in the country could encourage manufacturers to expand their cultivation areas. The article is abridged and first published in the Ogoniok magazine.